I'm not a huge fan of Jeff Dee's art in general -- I find it a bit too "comic book-y" for my taste, but I find it really hard not to love this illustration of a mind flayer from Expedition to the Barrier Peaks. This illustration exercised a huge influence over my young imagination. Having seen a mind flayer dressed up like an alien from an episode of Star Trek, I never again found it difficult to conceive of mixing science fiction in with my fantasy. Mind you, the entirety of module S3 was an object lesson in not being bothered by such things. Still, this piece of artwork has long been a favorite of mine. It's hard for me now to think of mind flayers as anything but aliens from another world/dimension. I've always been a huge fan of Jeff's work for DnD. This illustration was high on my list, but his Paladin slaying the black dragon in the Rogues Gallery has to be my favorite and the work he did in the Slave Lords was great as well. Barrier peaks holds a place near and dear to my heart... mostly because I DMed it when I was 13... The perfect age to play a Fantasy/Sci Fi without getting tripped in pseudo-fridge logic loops. Honestly, it never struck me all that odd at all. The original Deities and Demigods hardback had Lovecraftian gods from the stars and if I remember correctly, the Monster Manual had Aboleths and Mind Flayers that seemed, to me, might be long lost cousins of those alien horrors. It never took that much imagination for our group to accept such science fiction ideas of Flesh Golems either. (Frankenstein was always more of a Science Fiction story to me rather than a horror story) Nevermind that OD&D has robots listed in Monsters and Treasures. Arther C. Clarke once said, any sufficiently advanced technology is indistinguishable from magic. To me, no greater invitation to imagination has ever been given, for that quote alone breaks allot of 'so-called' barriers. I've always enjoyed a mixed bag of sci-fi and fantasy. Consider the works of Erich von Däniken, Jacques F. Vallée, or even Zecharia Sitchen. While clearly not true science, the 'science fictiony' elements of their works clearly draw a line to ancient aliens/monsters/gods of legend. It simply was never to much of a stretch for me to include these concepts in any D&D setting I was working on. Huge Jeff Dee fan here - but it's interesting to note that a lot of readers of your blog as well as you, James, indicate that your 'link' to grasping D&D was your love of swords and sorcery and SF fiction. 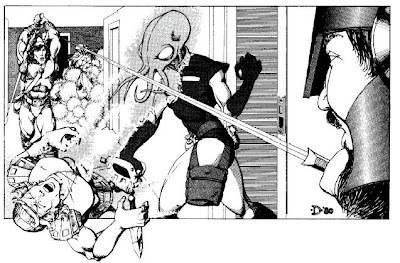 I came into it in 1981 by reading a D&D strip in the back of an X-Men comic, so I think my impressions of D&D and fantasy have always been colored by my love for superhero comics, just as some of the fans of later editions have an anime 'touchstone,' if you will. As I've been reading REH's original Conan stories (in the three volume set recently published) I find it interesting that REH certainly did not have a problem with Sci-Fi and Fantasy mixing at the party. There are clearly story lines, character exposition, or dreams by Conan, that are, from the character perspective "fantastic," from the reader perspective an establishment of the alien backdrop/foundation to the gods and mystery filled ruins of the Hyborian Age. Pick Xuthal of the Dusk, Queen of the Black Coast, even The Tower of the Elephant, and it is obvious, IMHO, that REH was not afraid if mixing genres.